Use the finest quality chocolate when making fondue. Commonly available quality brands like Valrhona and Guittard are a perfect. choice. Supermarket baker’s chocolate and chocolate chips are a poor (think waxy) substitute. Photo courtesy Sugardaddy’s. Fondue comes from the French word fondre, to melt. It was invented hundreds of years ago in Switzerland as a way to make use of dried-out Gruyère and Emmental cheeses. This “last resort” device has turned into one of the most enjoyable dining pastimes. Family and friends have fun sitting around the communal fondue pot, spearing bread chunks and dipping them into delicious melted cheese. Chocolate and beef fondue are newer inventions. Chocolate fondue actually originated in New York City in the 1950s, although it is Swiss in origin: the brainstorm of a Swiss chef at a Swiss restaurant (Chef Konrad Egli of the Chalet Suisse, no longer in operation), who melted down Toblerone bars. Fondue is a double delight: delicious and simple to make. A basic recipe and some variations—including a sugar-free version—follow. But we can’t stress strongly enough: quality input equals quality output. If you want it to taste like fondue from a top restaurant, don’t melt down chocolate morsels from the supermarket. Use fine bar chocolate (or shavings or drops): for not much more money, there’s a world of difference in taste. Warm cream in a saucepan, double boiler or fondue pot, over low heat. Bring to a simmer, but do not boil. Add chocolate pieces, stirring constantly until chocolate is melted. 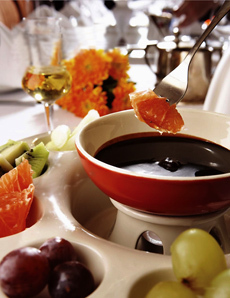 You don't need a special fondue pot or chafing dish in order to serve chocolate fondue. While the pot and stand with its tea candle or Sterno flame is atmospheric, you easily can use a glass or ceramic bowl. This way, you can bring it to the microwave to re-heat as needed. 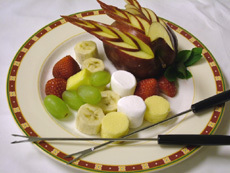 Choose an assortment of dipping pieces: two to three fresh fruits, two dried fruits, one pastry and marshmallows. Fresh fruit should be ripe but firm enough not to fall apart while dipping. Don't cut fruit too thin or it will fall off the fondue fork. If you serve cake, lightly toast the cubes and don’t cut them too small for the same reason. *SUGAR-FREE VARIATION: People on sugar-restricted diets who can eat the other ingredients should use 99% or 100% cacao chocolate. Several fine chocolate companies offer bars in these percentages. Then, add 1/2 cup of cooking-formulation sugar substitute (the formulations in the large formats for cooking are often constituted differently from the individual packets). Chocolate and orange are a great match. Combine cream and butter in a large saucepan over medium heat. Bring to a simmer, stirring constantly. Stir in optional liqueur or flavorings.